An emerald cut diamond, Art Deco style ring featuring a central emerald cut diamond held within four claws and flanked on either side by graduated, stepped baguette cut diamonds. 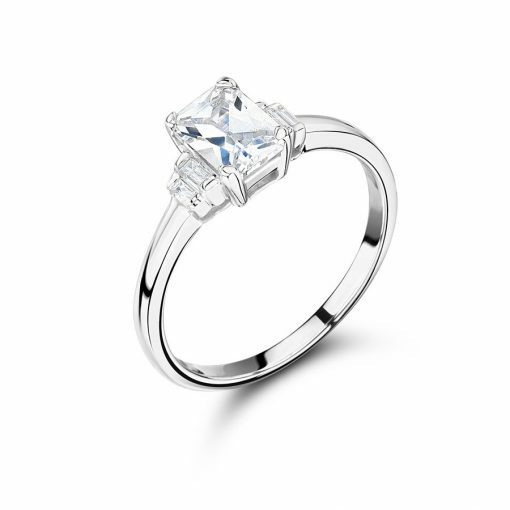 Completed by a simple polished band, this Art Deco style ring is the perfect union of simplicity and understated elegance. At Voltaire Diamonds, we work with you to create the engagement ring of your dreams. This style can be custom made to your unique requirements. Thinking of creating a ring similar to this? We would be delighted to meet with you at our offices just off Grafton Street, where we aim to provide a comfortable and exciting service for one of the most special purchases in your lifetime.